-We have Ethan and Lena in the Beautiful Creatures movie! 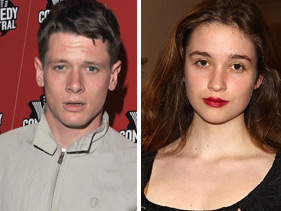 Actors Jack O'Connell and Alice Englert will play the lead roles. This isn't how I pictured either character, although Ethan is a bit closer than Lena. Thoughts?? -Emma Thompson will also be starring in Beautiful Creatures-she's taking on the roles of Mrs. Lincoln and Sarafine. This casting I really like and I think she'll be great! 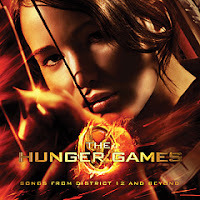 -The Hunger Games soundtrack cover was released this week. Taylor Swift's video for her song "Safe and Sound" will air Monday evening at 6:54 Central Timeon MTV. -Mockingjay.net has new Capitol ads featuring Cinna, Seneca Crane and Ceasar Flickerman. -Fox 2000 has optioned John Green's newest novel, The Fault in Our Stars, for a feature film. Entertainment Weekly is asking who you think should star in the film-so check out their suggestions. -Patrick Carmen's interactive series Dark Eden may be getting a movie series. -Viola Davis will not only star in Beautiful Creatures, but she's also signed on for Ender's Game. Wow, lots of great news. I love the fact that Emma Thompson is going to be in Beautiful Creatures. And, I actually like the girl they casted for Lena better than I like their Ethan...but I'm sure it'll all work out okay. I'll be glad when the Hunger Games soundtrack is out! Oh, I looove Jack O'Connell, so now I have to read the book so I can watch the movie, too!